If you’re looking to buy a home in Virginia, working with one of Equity First Realty’s® full service agents and skilled negotiator with over a decade of real estate experience costs you nothing. In fact, YOU get paid to work with me! 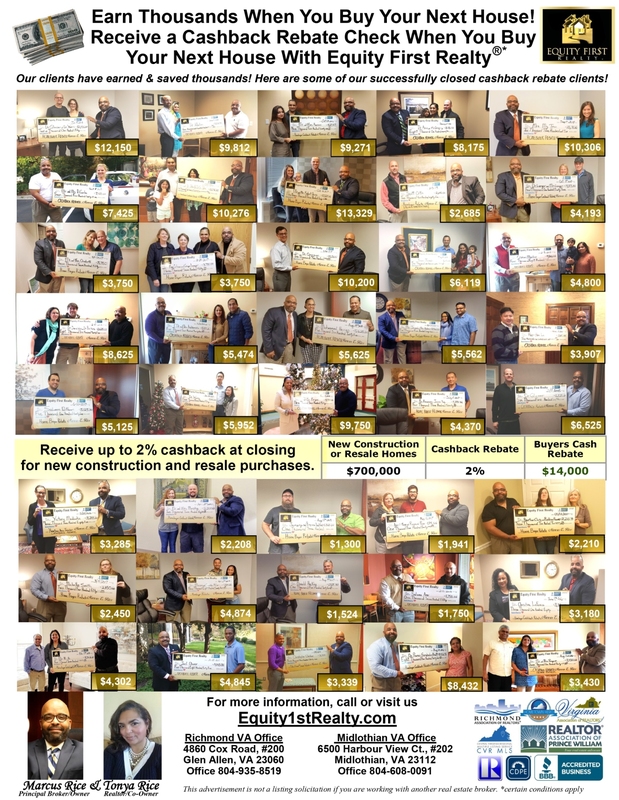 At settlement, you will receive a rebate of 50% of my agent commission which usually equals 1.5% of the net purchase price in most cases. For example, if you purchase a $500,000 home, receive $7,500 at settlement towards your closing costs. Whether you are looking to purchase new construction or existing home in Virginia, let Equity First Realty® provide you with professional, friendly and efficient service that makes the home buying experience as enjoyable and seamless as possible. Equity First Realty® also loves working with first time buyers! You can search the entire local MLS without any obligation or just let us know what you are looking for and Equity First Realty® will do the rest! 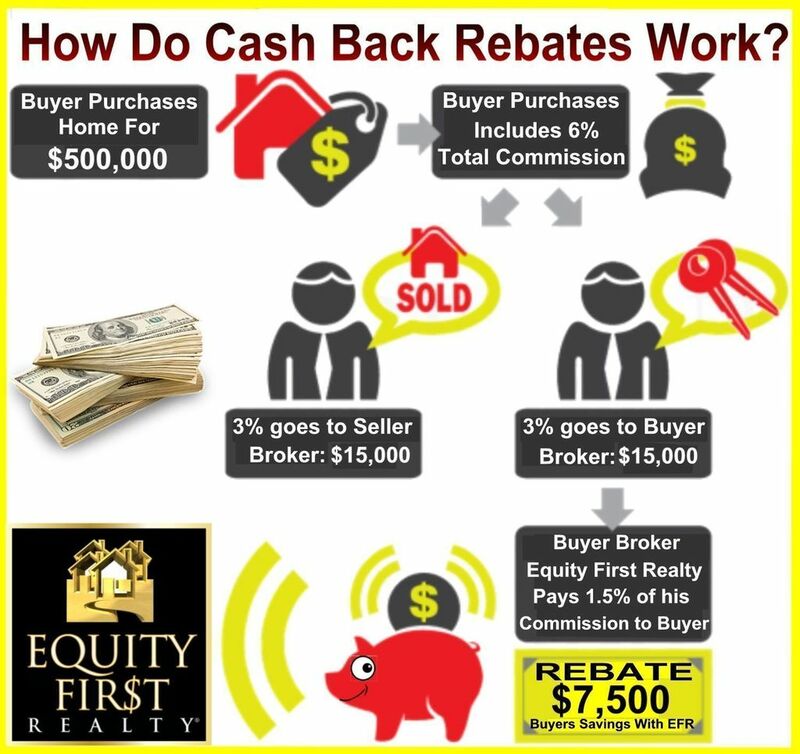 The Buyers Reward Rebate Program is Virginia’s Most Buyer-Friendly Rebate Offer ~ Honest and experienced buyer representation from experienced real estate brokers and agents. ~ Commission rebates are 100% permitted in Virginia and promoted by the U.S. Department of Justice: http://www.justice.gov/atr/public/real_estate/rebates.html . Equity First Realty® is made up of people, and people buy homes. We’re not just experienced real estate professionals in various Virginia real estate markets, we’re home buyers too. It takes more than a trained real estate agent to understand the needs and concerns of buyer clients. It takes someone who has been there, someone who has the same concerns when they’re home shopping. The professionals at Equity First Realty® are here to assist buyers in multiple Virginia real estate markets, and we’re really good at our jobs. Click the links to find out more about our cash back rebates for new construction homes and resale homes to see how much you can save and research our Buyer Rebates FAQs page.